Adrienne Lyle went knocking on the door with a dream of being a horse trainer six years ago. The 26-year-old Ketchum resident is now knocking on the door of being one of the best dressage riders in the world. Competing in driving rain at Devon, Pa. on Oct. 1, Lyle and a 12-year-old Oldenburg gelding named Wizard won the highlight Grand Prix Freestyle at Dressage event at Devon. Their second straight victory in a World Cup qualifier elevated Lyle and Wizard to the top tier of contenders for the U.S. team headed to the 2012 London Summer Olympics. It's an unlikely pairing, but a promising one for the future. Wizard, owned by Peggy and Parry Thomas of Hailey's River Grove Farm, was purchased as a 5-year-old from the Netherlands. Lyle, the daughter of Greg and Anne Lyle of Ketchum, grew up on Whidby Island near Seattle with aspirations of becoming a horse trainer. Her dream persisted, although Adrienne went to college for business management and pre-med animal science. Her parents bought a condominium in Ketchum six years ago, about the time Adrienne showed up for a lesson at River Grove Farm and met trainer Debbie McDonald—the Olympic and world championship medalist on Brentina. Now, Lyle works full-time for the Thomases, training horses and teaching. She and Wizard are a formidable pair. Adrienne is tall at 5-11 and Wizard measures 17.1 hands (69 inches from the ground to where the neck meets the back), which is pretty much the size of heavy riding or draft horses. Lyle said about Wizard, "I've been riding him since 2006, and training under Olympian Debbie McDonald at River Grove Farm. We believe Wizard is incredibly talented, with international potential." In spring 2010, Lyle competed with Wizard in Germany. The horse suffered an injury last year that kept him from competing for much of 2011. Since resuming competition, Lyle and Wizard have notched three straight Grand Prix wins—at Saugerties, N.Y. in September and at Devon. Said Lyle, "This was Wizard's and my first time ever competing on the East Coast. Our main reason for this tour of East Coast shows was to get a chance to go head-to-head in competition with some of the big names in the sport, that we don't have a chance to compete against on the West Coast. "While back East, we competed in two CDI-Ws (International World-Cup Qualifying dressage competitions). At the CDI-W in Saugerties, we won the Grand Prix Freestyle. That's a pattern, with certain compulsory movements, that is choreographed by the rider and set to music. It's like a figure-skating freestyle routine. "Then, two weeks later, we competed at the CDI-W in Devon where we won both the Grand Prix and the Grand Prix Freestyle. The Devon horse show was a particularly special experience for me. It is a legendary and historic horse show, with an incredible atmosphere. "The Grand Prix classes were held at night, under bright lights, in a huge sold-out stadium. It was absolutely pouring down rain during both my rides. But it didn't seem to dampen the spirits of my horse, or of the loudly cheering crowd. "After our success at these two Eastern shows we have a good shot at being selected, as one of only two from the U.S. and Canada, to compete at the 2012 Dressage World Cup, held in the spring in the Netherlands. Looking even further into the future, we have our sights set on the 2012 Olympic Games in London." In both Grand Prix events at Devon, Lyle and Wizard defeated defending champion Catherine Haddad Staller of Germany, on Winyamaro. In addition, Lyle and Wizard competed under the lights for the first time, handling it well. Lyle seems to have a lack of show nerves, in large part because of the teaching of Debbie McDonald and her husband, Bob. She told dressage-news.com, "Bob once told me, 'You have too many other things to think about that you won't have time to get nervous.' Once I get in the saddle I just focus on what I need to do." There are 12 World Cup qualifiers in the U.S. and Canada next year to qualify for the 2012 Final. Now that they've returned from the East, Lyle, the McDonalds and the Thomases will plan their 2012 schedule. Lyle said, "It's been my lifelong dream to be able to represent my country in international competition. "It takes an incredible amount of support to make a horse and rider combination successful at the highest level of this sport. I am eternally grateful to the Thomas family (owners), the McDonalds (trainers) and the support staff at River Grove Farm. 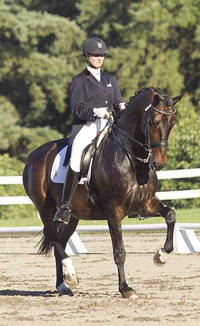 "Debbie McDonald, my trainer and mentor, has ridden in two Olympic Games, the World Cup, and World Equestrian Games. It is my dream to someday follow in her footsteps."